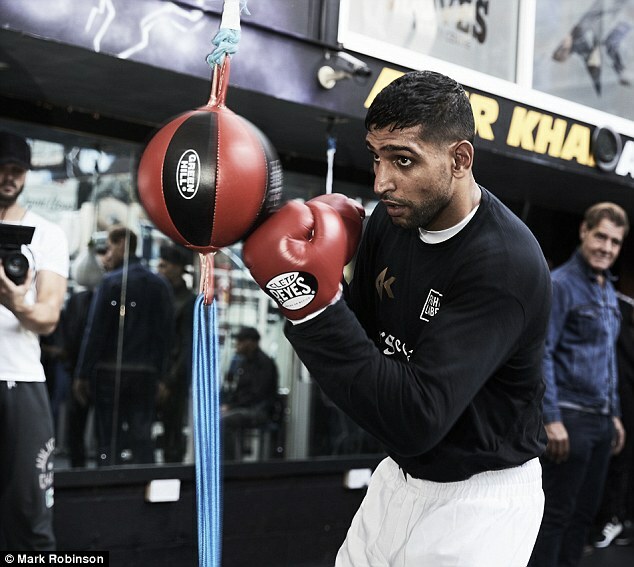 Never mind that he has won an Olympic silver medal and two world titles for Britain, Amir Khan is still the victim of the social media trolls. His reaction is to use his broad shoulders to shrug off the foul-mouthed barbs, threats and insults. He says: ‘I don’t let it bother me. At least they are talking about me, so I must be doing something right. I love both countries. I believe I set an example to youngsters in the UK and I go to Pakistan to do all I can to help improve the lives of struggling young people there. At some of his big fights the cheering for his exploits has been infiltrated by jeers. More so here on occasion than in America. That sad, negative reaction is less likely this Saturday night as Khan continues his comeback against Colombia’s Samuel Vargas. This potential stepping stone towards a super-fight with Filipino legend Manny Pacquiao and a domestic blockbuster against Kell Brook takes place in Birmingham. He should beat Vargas, who is a step up in class from his first comeback opponent Phil Lo Greco, who he blew away in 39 seconds. Assuming he prevails, he can move on to punching to the unconverted. His own most recent upset was as severe as it gets in the ring. A brutal, totally concussive knock out by Canelo Alvarez in Las Vegas when he moved up two divisions to middleweight in his frustration at missing out on a legacy fight against Pacquiao or Floyd Mayweather. His doubters called time on him but he will not be making that mistake again. Welterweight is the division in which he hopes to challenge Pacquiao for his world title — and the weight to which he insists Brook must return from super-welter for their long-awaited Battle of Britain. Nor does he intend to if he sweeps Vargas, Pacquiao and Brook before him in the coming months The welterweight division is bristling with Pacquiao’s rival alpha-belt world champions Keith Thurman, Terence Crawford and Errol Spence Jr.
To that end, he is doing his best to shake off his reputation for high living. His marriage is solid and his sole escapade of late has been a ticket for parking on a footpath outside a restaurant. ‘I love boxing,’ he says, knowing that with a good performance on Saturday, he will go some way to silencing the social media trolls.